With the TV Listener, one person can enjoy the television while the other sleeps, reads or studies. Also perfect for individuals with hearing loss, this complete cordless infrared system allows one family member to listen to the TV at a higher volume level than other people who are in the same room. The disk transmitter and ergonomic headset deliver superior sound when used with nearly any TV or audio source, allowing you to enjoy your favorite TV shows or radio programs without wearing a bulky headset. Infrared technology has no interference, tuning adjustment or frequency drift, and the battery life is longer. Infrared transmits clearly because it uses light waves, just like a TV remote, to transmit sound. 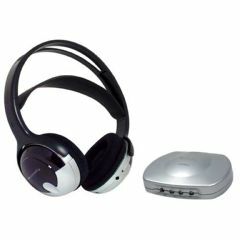 The headset receiver then converts the light waves back into high fidelity stereo sound. Everything went as expected - well. Elderly. Very Senior, 85 yrs..
Not a problem, but the product was different than photograph. As I had one, the photo shows an older model. Everything was as expected, and well done. Can't move out of range. Elderly. Spouse reads in same room. Spouse reads in same room. I listen to TV while my spouse reads in the same room. I am able to mute the TV and it doesn't bother her. Elderly. Good for hearing impared..
Bought for my wife.. She likes Tv loud.. Since my wife likes the TV loud, it is very annoying. With the TV headphones, she can set her own volume and not drive me crazy. I bought this for my 83 year old Dad so I wouldn't lose my hearing! We can watch the same show together at different volumes. It comes with rechargeable batteries, I recommend buying a second set of batteries so you can always be charging one. the on off switch on the head set is hard to switch. Does TV need audio out ports to connect to transmitter? I only have digital opt out on my TV. Does this devise allow me to hear a program at an increased volume while my wife listens to it normally in the room? The headsets sold by sony get plugged into the speaker system of the TV and therefore there is no sound for anyone in the room to hear. I need something that allows me to have the increase in volume while others listen normally. The headset has it's own volume control and therefore the TV can be set at one volume and the headset at another. The headset can get very loud. Can other people listen to the TV at the same time using their own volume level while this item is being used? What all comes with the set? Also, if my spouse is listening via the headphones, would I be able to hear the program without headphones? This set comes with the headphones, the transmitter, electical cord, cord to chsrge hesdphoned, and cord with several adapters to hook to the television. What powers them? the type of battery? I didn't find the rechargeable batteries to last very long. Only a few hours so I replaced them with Duracell batteries that have lasted several days. I have an old TV Listener that uses a mic dangled over the stereo speaker to get the sound which is then transmitted by infrared to the headphones. How does this pick up the sound from the stereo/TV?